The new TEC-200 series engine management systems represents the current in state-of-the-art fuel injection and direct ignition control integrated into one revolutionary package. 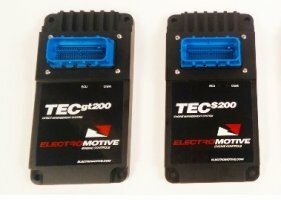 The TEC-200 products are PC-programmable engine control systems featuring a powerful Windows-based tuning environment. Converting from carburetion to fuel injection has never been easier than with TEC. Whether you choose to run throttle body injection, multi-port, or individual throttle bodies, TEC will provide you with the ability to tune your engine to its peak capabilities. Street enthusiasts will enjoy the benefits of a ‘distributorless’ ignition system that not only is infinitely adjustable, accurate, and powerful, but also gives you improved engine compartment clearance and freedom from all those ignition amplification boxes that you used to run in the past. If you are running an aggressive profile camshaft, idle control has always proven to be problematic for lesser engine management systems, but not for TEC. Within the WinTEC software resides Speed Density (MAP) or Alpha-N (Throttle Position) based and our exclusive ‘TPS/MAP Idle Blend’ table. With a few clicks of the keyboard, you will enjoy an idle quality that other engine management systems only dream of having. For competition and ultra high output engines, the sophistication and power of the TEC-200 systems simply out-performs other production and aftermarket systems. With full control of the engine over all possible operating conditions, outputs that will control nitrous, boost, VTEC, and other devices, new rev-limiters with ‘Triple Smooth’ technology, and On-Board Data Acquisition, TEC-200 products give you Total Engine Control...and make the competition green with envy! The new TEC-200 ECUs incorporate the winning features of our previous TEC management systems while adding an abundance of new features and a powerful new processing platform. Electronic Fuel Injection (EFI) control and patented digital Direct Ignition control and Coil-On-Plug is standard hardware for every TEC-200 kit. Programmable GPO’s (General Purpose Outputs) to control or activate VTEC, Shift Lights, Water Pumps and Fans, A/C Compressor, Torque Converter and more.